Lord John is coming to town and bringing a surprise with him… Get a sneak peek of this week’s Outlander, “Blood of My Blood”! Sassenachs, we don’t know about you, but we haven’t been able to keep calm because OMG Murtagh is back! This is the moment we’d been waiting for so long, and it was sweet and emotional and thoroughly satisfying! Overall, in “Savages,” Jamie and Claire interacted with more of their Fraser’s Ridge neighbors, as they were trying to recruit settlers to join them. In the process, we saw them trying to mitigate conflict that seems to surround them. Claire found herself in the middle of conflict between new settlers and the local Cherokee, while Jamie dealt with conflict between farmers and Governor’s Tryon’s tax collectors. 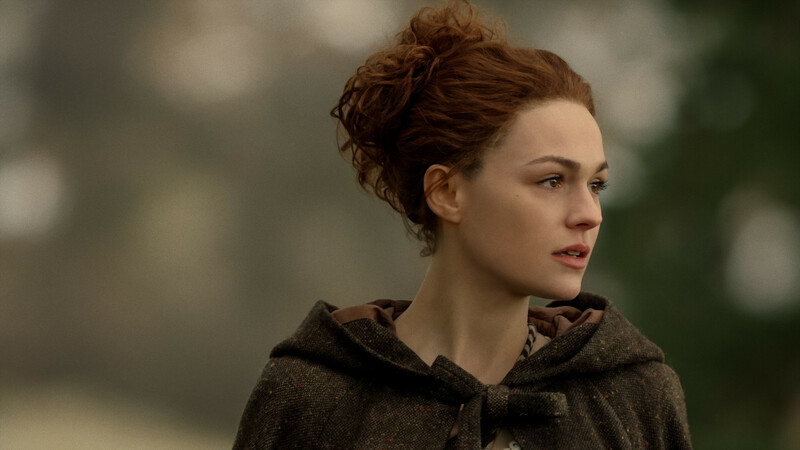 These conflicts became more personal as Claire was forced to confront Herr Mueller about Adawehi’s callous murder and Jamie realized that Murtagh was leading the Regulators. Elsewhere, we watched Roger deal with the fallout of Bree has going through the stones. As we’ve come to expect, the episode provided high highs and low lows, especially as the question remained, who were actually the true savages in this situation? Make sure to take a look at our written recap and video review where we shared our thoughts of this and more! If you’ve seen the preview for the episode, you know that Jamie will have an unexpected reunion with his son, young William… of course, this must trigger a lot of feelings for Jamie, especially as we see a confrontation with Native Americans over the boy’s mistake. But I keep thinking about Claire having to confront a man who’s in love with her husband and her husband’s child from another woman… all while missing her own daughter. As we’ve said before, Jamie and Claire are surrounded by conflict and we just see it escalating on all sides. Take a look at these 8 images, where we get a glimpse of Jamie and Claire interacting with more of their Fraser’s Ridge neighbors. Make sure to live tweet the new episode with us at 8p/9c this Sunday (December 9) on STARZ!